(AP) A small Welsh town where English King Henry V was born is about to make history again by becoming the world's first "Wikipedia town." 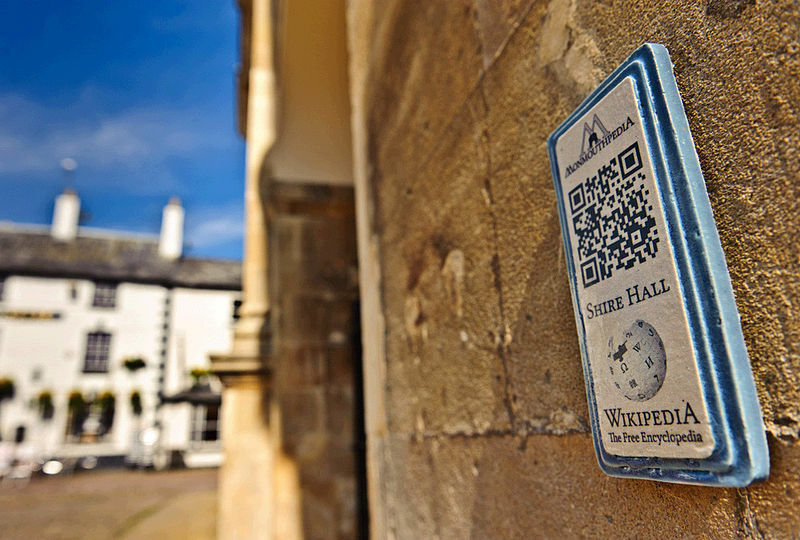 Visitors from Saturday will be able to use smartphones to scan barcodes at points of interest in Monmouth in Wales' southeast, instantly bringing up a Wikipedia page about the landmark on their phones, in whatever language they are set to. Wikimedia UK - which works to support, develop and promote Wikimedia Foundation projects such as Wikipedia - says hundreds of articles about the life and history of the town will be available online in more than 26 languages, from Hindi to Hungarian. Around 1,000 different bar codes plaques and stickers now decorate its schools, museums, historical sites and even pubs. The project - dubbed "Monmouthpedia" - has been in the works for six months, helped along by the local council's installation of town-wide free Wi-Fi. Local residents and businesses have created and edited articles about Monmouth that are linked to the barcodes, while other volunteers have been translating them. Czech speakers can now learn about Monmouth Castle in their native tongue, while Fijian Hindi speakers can check out articles on the Monmouth Cricket Club, Methodist Church of local Kings Head Hotel. Scholars of lesser-known languages such as Esperanto or Latin also have their pick of Monmouth-related articles. Stevie Benton, Wikimedia U.K.'s communications organizer, said Thursday that more than 450 new articles about Monmouth have been added to Wikipedia and nearly 150 existing articles have been improved in the past six months. While the project is geared at capturing "every notable place, person, artifact, flora and fauna" in the town, some less-historically notable - but equally welcome - articles have been added, said Benton. "It's really captured people's imaginations in ways we hadn't expected," he said. Benton said he is hoping other towns will also take on the initiative, because all it takes is "a bunch of people who are motivated and energized." Wikipedia founder Jimmy Wales said in a statement that he's looking forward to seeing other towns and cities take on similar endeavors. "If everyone shares the stories of their local area, we'll have a much clearer understanding of the world we live in and that's a powerful thing," said Benton.